Does Samsung care how many “Android” units were sold? No, they do not. They only care about how many of their devices they sold. Do the various Android manufacturers in China care how many “Android” units were sold? No, they do not. They only care about how many of their respective devices they sold. Does Amazon care how many “Android” units were sold? No, they do not. They only care about how many Amazon devices are being used to direct traffic to their web site. Do Android developers care how many “Android” units were sold? No, they do not. They only care about those Android units that their software can address and, even more specifically, they only care about that portion of the addressable market that is interested in purchasing their product or downloading their product and consuming their advertising. Does the Google Play store care how many “Android” units were sold? No, they do not. They only care about how much is purchased from the store. Why Do We Count Android As A Single Entity? “Android” is not a single entity. So why do we add all of the “Android” numbers together? We do it because we assume that higher numbers mean a stronger platform. We use it as a proxy for the strength of the platform. But it just ain’t so. Total numbers mean nothing. The only numbers that matter are those that strengthen the platform. And do you know who agrees with me? Google. Google reported that the number of Android units using Android versions 4.1 to 4.2 jumped from 16 percent a month ago to 25 percent this month. Impressive, no? I agree. This is a better way to count the meaningful numbers rather than just the gross number of Android activations. However, did you notice the inconsistency in Google’s new math? Google hasn’t recalculated and lowered the total number of Android activations. In other words, when it comes to telling you how many activations they have, Google uses devices that check in to their servers. But when Google wants to tell you which versions of their operating system are in use, they only count user visit’s to the Google Play store. Hmm. So we now know that versions of the Android pie are divided into different sized slices but what we don’t know is just how big that pie is. Exactly how many of the 144,720,300 units sold in the fourth quarter of 2012 are actually accessing the Google Play store? We don’t know. Because Google isn’t saying. And until they do, those total unit sales and activation numbers have little meaning in determining the overall strength of Google’s portion of the Android platform. “Android” shouldn’t be counted as a single operating system any more than Europe should be counted as a single country. Heck, Android doesn’t even have a “common market“. If we’re going to use numbers as a proxy for determining the strength of various operating systems, then we have to use meaningful numbers. Perhaps we should be comparing the units running the latest version of iOS with the latest version of Android. Perhaps we should be counting the Amazon, Google, and the various Chinese portions of Android as distinct and separate entities. Perhaps we should even be counting that portion of the Android phones that run Facebook Home separately too. What we most certainly should NOT be doing is lumping all Android sales and activations together and pretending that they’re one and the same and that their total numbers are advantageous to all of Android’s separate participants, such as Samsung, HTC, Amazon, Google, developers, etc. If an activation or a unit sale doesn’t count towards the strength of the whole operating system, then it shouldn’t be totaled. 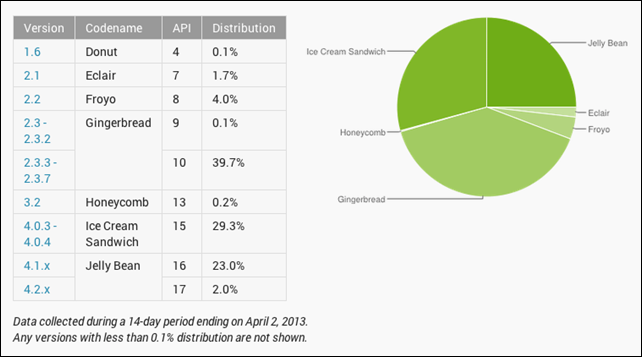 Totaling Android’s numbers together doesn’t make sense because there isn’t a single, unified Android platform. Numbers should be used to reveal, not conceal. And Android’s numbers aren’t revealing its strengths, they’re concealing its weakness.